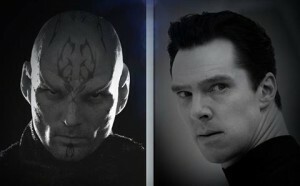 The previous two villains of the “Star Trek” films, Nero and Khan Noonien Singh. A new villain has been rumored to be added to the cast of 2016’s Star Trek film. The 50th anniversary of the franchise is said to include a Bryan Cranston-like actor in the role of the USS Enterprise‘s new enemy. Villains in the previous two alternate reality films have been Eric Bana as the vengeful Romulan Nero and Benedict Cumberbatch as the new take on previous franchise villain Khan Noonien Singh. The new film is also rumored to add three new females characters, the captain of a Federation ship, Dr. Leonard “Bones” McCoy’s ex-wife, who was mentioned in 2009’s Star Trek and the President of the United Federation of Planets. The film will take place during the Enterprise‘s five-year mission, which first began at the finale of previous film, Star Trek Into Darkness, and be closer to the tone of the original Star Trek series, with the bridge crew of the previous two films said to return. It was earlier discussed as a possibility that Cumberbatch’s Khan would return, but that is uncertain at this time. Also uncertain is the return of Alice Eve’s Carol Marcus, who in the prime timeline was once a lover of William Shatner’s James T. Kirk. No casting news has been stated for the new character of 2016’s Star Trek film, save for the prior stated Bryan Cranston or a Bryan Cranston-like actor in the villain role. Written by Simon Pegg and Doug Jung and presumed to be written alongside previous writers J.D. Payne and Patrick McKay, the film will be produced by J. J. Abrams, Bryan Burk, David Ellison and Roberto Orci. Directed by Justin Lin, it will release on July 8, 2016, just in time for the franchise’s 50th anniversary. You can follow future updates of the franchise on the official Star Trek website, Facebook and Twitter. Comments for 2016’s “Star Trek” Film Rumored to Add Bryan Cranston-like Villain and More Female Characters are now closed.